Tunisia’s government is stuck between its own workers and the IMF. What’s next? In February, the Tunisian General Labour Union (UGTT) and the Tunisian government signed an agreement that increased public sector wages, following two successful general strikes in 2018. 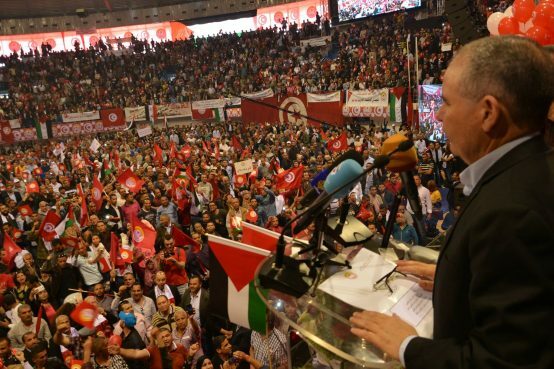 This constitutes a victory for the Tunisian trade union movement against the dictates of the IMF to reduce the public wage bill regardless of the social costs and Tunisia’s specific transition context. In fact, under the IMF programme, Tunisian currency has lost more than 90 per cent of its value over the last five years, inflation reached record levels in 2018, while employment has stagnated, and growth has been slow to resume. All of this adds to a social climate that is increasingly tense, as evidenced by the UGTT strikes. Such a victory illustrates the key role that UGTT play in mobilising workers and citizens to defend economic and social rights. 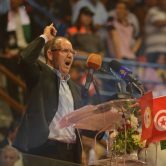 In a region that lives under the rule of dictatorships and arbitrariness following the Arab Spring, Tunisia is the last serious candidate remaining in the race to achieve an exemplary democratic and economic transition, based on the universal values of human rights and gender equality. On the political front, the success of the National Dialogue in 2013 – where unions, employers, human rights defenders and lawyers in Tunisia organised talks between different forces to create a collective roadmap – has allowed for a smooth transition with a second successive democratic election in 2014. As for the economic plan, a consensus has been established on the need to break away from the rules of the game that govern the economy, characterised by the proliferation of rentier activities benefiting those close to power, tax fraud, a large informal economy, and corruption that systematically undermines almost all economic transactions. The expectations of Tunisians amid the National Dialogue were clear: unleash the potential of the Tunisian economy and take advantage of its educated youth, and the natural and cultural wealth of Tunisian regions, while responding to the pressing needs of marginalised populations, particularly unemployed youth. The reforms needed to implement this vision required expansionary economic policies to rapidly improve living conditions and create new economic opportunities, while taking into account a set of binding constraints related to the political context of the transition. These include, in particular, the difficult regional environment – especially for Tunisia’s Libyan neighbour – and the terrorist threats hovering over the entire region. Such a democratic and economic transition would have required significant financial resources and unconventional economic policies supported by its partners and friends. However, the authorities’ reliance on the IMF in the hope of gaining access to affordable finance hampered Tunisians’ hopes of breaking with the old system and putting the country on a new path of development. Indeed, in its customary fashion, the IMF has landed in Tunisia with generic recommendations that it tries to impose without considering the Tunisian socio-political context, and without real consultations with social partners. The IMF has imposed new policies based on reducing the wage bill, depreciating the national currency, reducing the regulatory role of the state, encouraging public-private partnerships, and removing food and energy subsidies without considering unforeseeable consequences on social stability and cohesion. The IMF has supported the government in pursuing the above policies while turning a blind eye to the country’s real priorities of: (i) ensuring tax justice by establishing an efficient and fair tax system, (ii) recovering tax debts that represent more than 8 per cent of national GDP, (iii) reforming the banking system to mobilise sustainable resources for investment, (iv) imposing quantitative restrictions on imports and illegal trade to protect consumers and national enterprises, and (v) breaking definitively with inefficient labour market policies and implementing structural policies capable of reducing the unemployment rate, which sits at more than 15 per cent and affects more than 30 per cent of youth. Unfortunately, the IMF blindly supports policies that ignore the real national problems while hiding behind the mirage of macroeconomic stability, in the absence of a coherent vision for economic development. The IMF must recall that, in 2010, Tunisia was hailed as the model student of international donors with a budget deficit of 1 per cent, a debt of 40 per cent of GDP and inflation of 3 per cent, while more than 20 per cent of the population was living in poverty and more than half of workers were engaged in informal work. 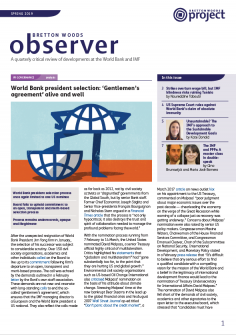 The IMF must break with its current approach and place human rights at the heart of its programmes, in compliance with the UN Guiding Principles on human rights impact assessments of economic reforms (see Observer Spring 2019). By pursuing its current policies, the IMF will undoubtedly contribute to breaking the Tunisian dream and will be among those responsible for the return of dictatorship and the clandestine migration of hopeless young people. Tunisia and all the developing countries deserve much better than these blind policies.